Your healthcare team may recommend surgery as part of your treatment plan. This section provides descriptions of the 2 general types of surgery (potentially curative and palliative), brief discussions of the most common surgeries, and links to additional resources where you can find more information. Surgery is often used in combination with radiation therapy and chemotherapy. And it may be used in combination with other therapies as well. There are 2 general types of pancreatic cancer surgeries: Potentially curative and palliative. Potentially curative surgeries are performed when tests, exams, and the staging process, indicate that it’s possible to remove all the cancer. Many times, however, once surgery has started, the surgical team discovers the cancer has grown too far to be surgically removed. In these cases, surgery is stopped. Or the surgeon may continue with a smaller surgery to relieve or prevent symptoms. The most frequent reasons to perform palliative surgery are to unblock a blocked bile duct, or to bypass it. All these surgeries are major, complicated, and can take many hours to complete. Best patient outcomes are achieved by surgeons who have experience with these particular surgeries, in facilities that are also experienced with caring for patients who have had these surgeries. 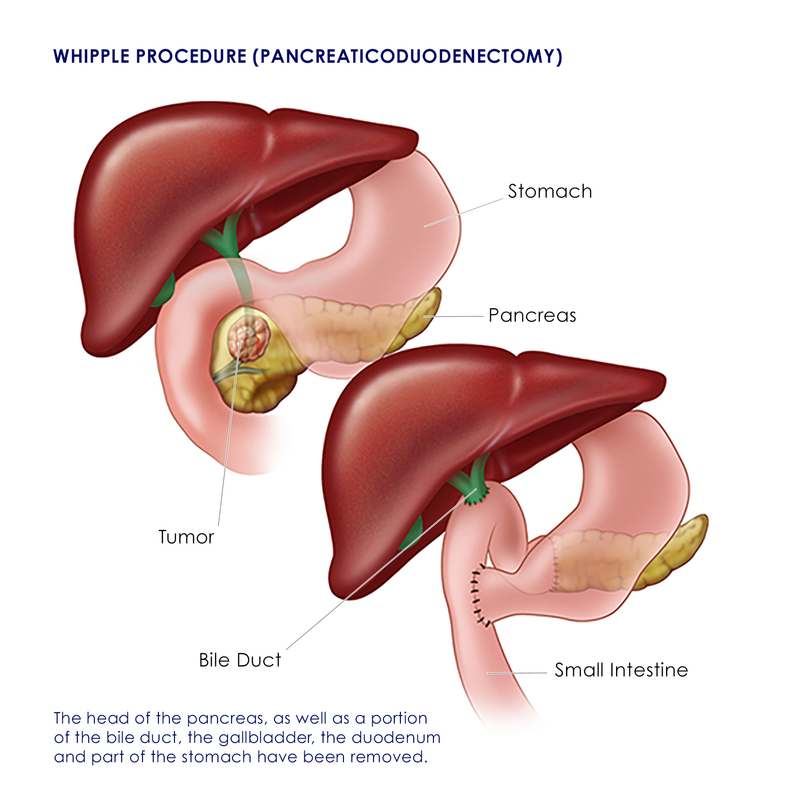 The standard Whipple procedure is the most commonly performed operation to remove tumors of the pancreas. In this operation, the surgeon removes the head of the pancreas, a portion of the bile duct, the gallbladder, the duodenum (first part of the small intestine) and part of the stomach. The rest of the pancreas, the bile duct and the stomach are reattached to the small intestine. There are variations and modifications of the Whipple procedure and your surgeon may recommend one of them. Complications can include trouble with the stomach emptying, bleeding, infections, and leaking from the various connections that the surgeon has to make. In this operation, the surgeon removes only the tail of the pancreas or the tail and a portion of the body of the pancreas. The spleen is usually removed as well. This procedure is more commonly used to treat pancreatic neuroendocrine tumors (PNETs) in the tail and body of the pancreas. Complications can include leakage of pancreatic juices, bleeding, and infections. In this operation, the surgeon removes the entire pancreas, the gallbladder, part of the duodenum, the bottom portion of the stomach, and local lymph nodes. Because the entire pancreas is removed, the patient will become diabetic and must use insulin to control blood sugar level. He or she will also have to take pancreatic-enzyme supplements to properly digest food. For more information about potentially curative surgery, visit the American Cancer Society, the website of the American Cancer Society, and the Pancreatic Action Cancer Network. 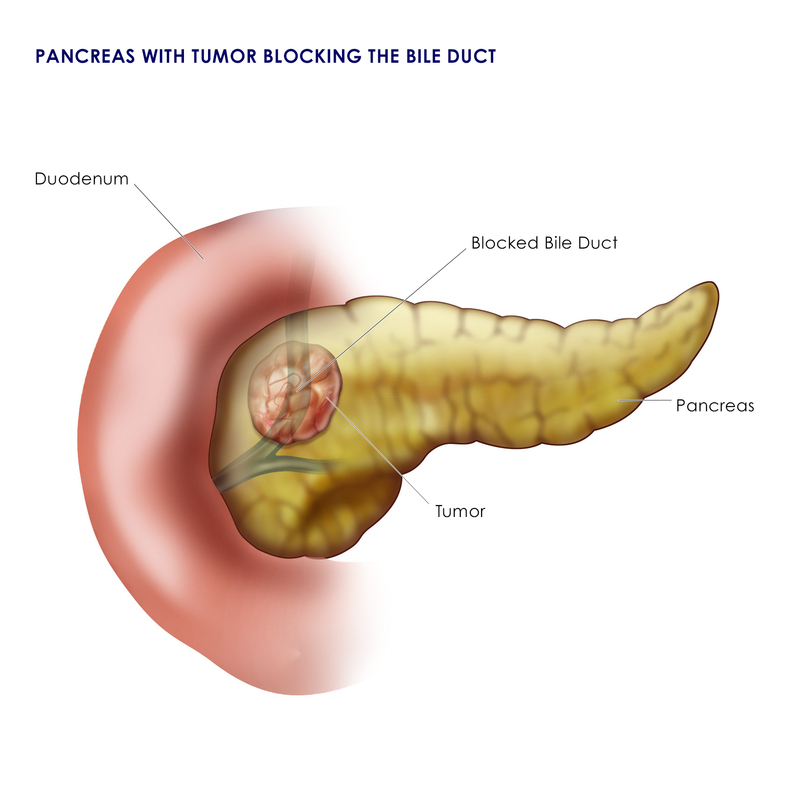 If tumors growing in the head of the pancreas block the common bile duct, the blockage can cause pain and digestive problems because bile can’t get into the intestine. Bile chemicals will also build up in the body and can cause jaundice, nausea, vomiting, and other problems. In this situation, a surgeon may perform a biliary bypass to reroute the flow of bile around the tumor directly into the small intestine. A biliary bypass is a major operation that often requires a major abdominal incision. 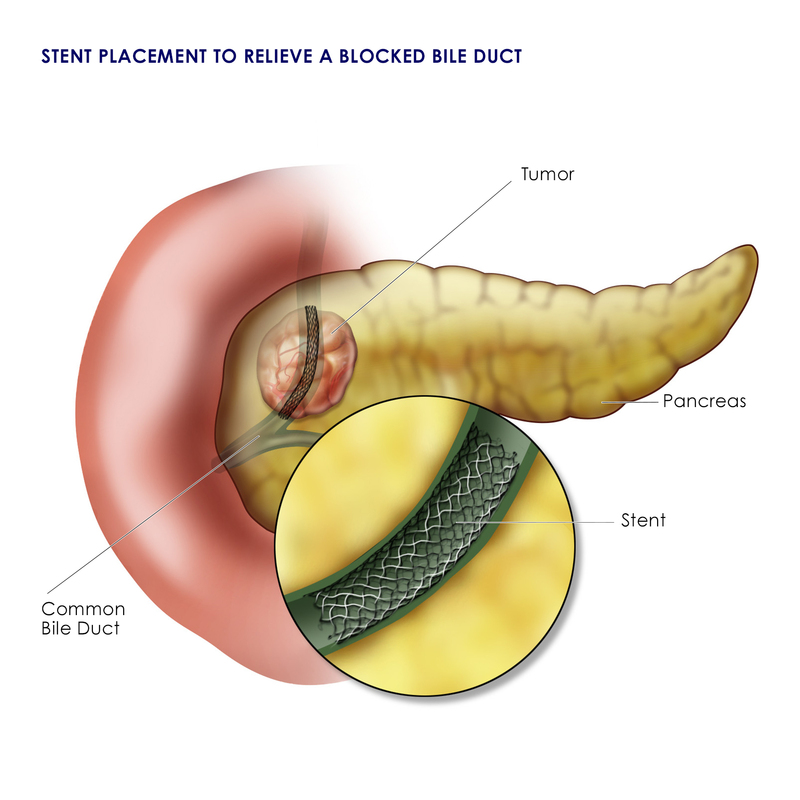 Stent placement is less invasive than a biliary bypass and is a more common approach to relieve a blocked bile duct. A stent (a small tube that keeps the bile duct open and resists compression from the tumor) is placed inside the bile duct through an endoscope. A stent may become clogged and after several months may need to be cleared or replaced. If a tumor blocks the flow of food from the stomach into the duodenum, the surgeon can perform a gastric bypass. It will allow food to flow past the blockage. People with advanced pancreatic cancer often experience severe abdominal pain caused by a tumor involving or invading nerves or organs near the pancreas. In some cases, a surgeon my recommend a celiac plexus block. A celiac plexus block damages the celiac nerves with the intent to ease pain. The block can be formed during surgery, through an endoscope, or through the skin. No matter the approach, complications from a celiac plexus block can be severe and may include low blood pressure, diarrhea, pain, and muscle spasms. Less common complications can include allergic reaction, kidney damage, seizure, and paralysis. For more information about palliative surgery, visit the American Cancer Society, and the Pancreatic Action Cancer Network.